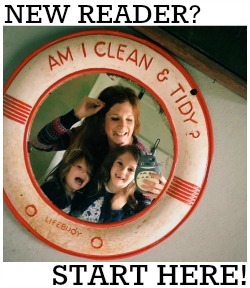 This morning I'm very excited to be publishing a brilliant guest post by the lovely Rosie from Style in View. Continuing on the topic of maternity style, Rosie is here to share some fabulous tips for dressing your bump during the Summer months! Despite the temperamental British weather, we are in fact in June. The sensible amongst us will have booked flights off to somewhere sunny and tropical, whilst the rest of us will be holding out for those rare glimpses of sunshine in which we can strip off the layers and wolf down a barbeque and an ice lolly as quickly as possible before the clouds reappear and rain on our parade. Quite literally. But whether you're a first time mum jetting off to paradise before baby arrives, taking the kids to Disneyland, or just hoping for an impromptu UK heat wave, there are some warm weather essentials that every yummy mummy-to-be will require to stay cool but look hot this summer. 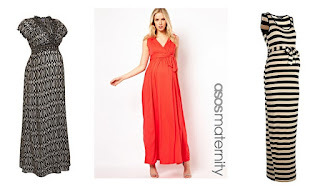 A couple of maxi dresses are a necessity for a summer with bump. Not only do they keep you cool and incredibly comfortable, but look gorgeous too. Empire line styles accentuate your new figure by drawing you in under the bust and delicately floating over the bump, whilst body hugging cotton maxis show off your curves. 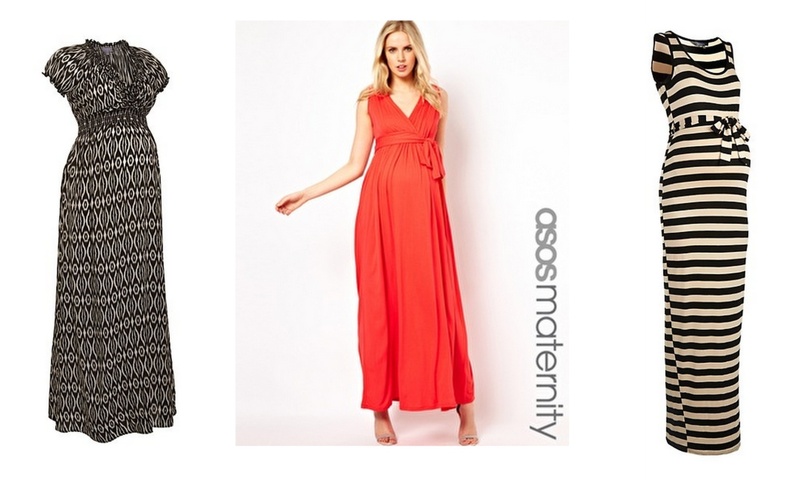 Investing in a couple of maxi dresses throughout your summer pregnancy will see you looking stylish for every occasion- a few jersey maxi dresses paired with sandals and a denim jacket make glamorous day wear, whilst a floaty chiffon number can be styled for everything from an evening out to a summer wedding. Many shorter women fear that they'll look frumpy in a long dress, but this is not the case. Aside from specially made petite maxi dresses, there are many ways to make the trend work for you. A belt around your waist, in a contrasting colour, can break up the long run of fabric in the dress and create the illusion of much longer legs! Just choose a soft elasticated belt, or turn the buckle to the back to avoid it digging into your belly. For an extra few inches, a comfy pair of wedges are a much safer alternative to heels when you've got a baby on board. And, if you're still not convinced, go for a ladylike midi dress instead. Although an ordinary swimsuit may appear stretchy, once your bump starts to show, you'd be best investing in some specialist maternity swimwear (unless you want to be physically cut out of a tight, wet suit that's stuck to your skin). Swimsuits, tankinis and bikinis especially designed with pregnancy in mind give a perfect fit over your bump, and stretch with you as you grow. Whether you choose to embrace your baby bump in a maternity bikini, or opt for a more modest swimsuit, there are loads of gorgeous designs to choose from. And if you can't decide between the two, maternity tankinis are a popular choice amongst expecting yummy mummies- they look great, are comfortable and are much more functional than attempting to wriggle out of a swimming costume when pregnancy's uncontrollable bladder needs relieving. Whether you want a pool side cover up, or a lightweight replacement for your cardigan to throw on when the sun goes down, try a kimono. No, I'm not talking about dressing your bump in a traditional Japanese garment, but the soft, drapey jackets that so effortlessly transform you into the queen of boho chic. Ethnic prints and tassels make for a cool and casual cover up, whilst beaded and sequinned numbers are perfect for pool side glam and special occasions. And the best thing? Because of their relaxed oversized style, you'll be able to buy a kimono jacket in your usual dress size and wear it throughout your pregnancy and into motherhood! Style in View is a brand new fashion search engine which is TOTALLY going to revolutionise the way we shop for clothes online. Its a bit like an online department store which stocks thousands of your favourite high street and designer brands - and where you can find and compare fashion at the click of a button. Trawling the internet will soon become a thing of the past - using the Style in View search engine instead of Google means you won't have to visit sites independently or be bombarded with random results. You can search by key word and then use style filters to browse their extensive collection of brands - plus their expert fashion editors carefully select each and every item that appears on the site, so you can rest assured that you’re always browsing the hottest trends and the best brands.